If you don’t have one then please consider buying a digital kitchen weighing scale (like this one for example) or convert to cups on the traditional oven website. My recipes usually have cup conversions but for sourdough recipes it’s going to be mostly metric in the interest of convenience and precision. A digital or probe thermometre is also useful to gauge water and dough temperatures but not essential. The easiest thing is to get a friend to gift you some of their starter or you can buy a starter at the bakery bits website here. They ship worldwide and it comes with clear instructions and information. 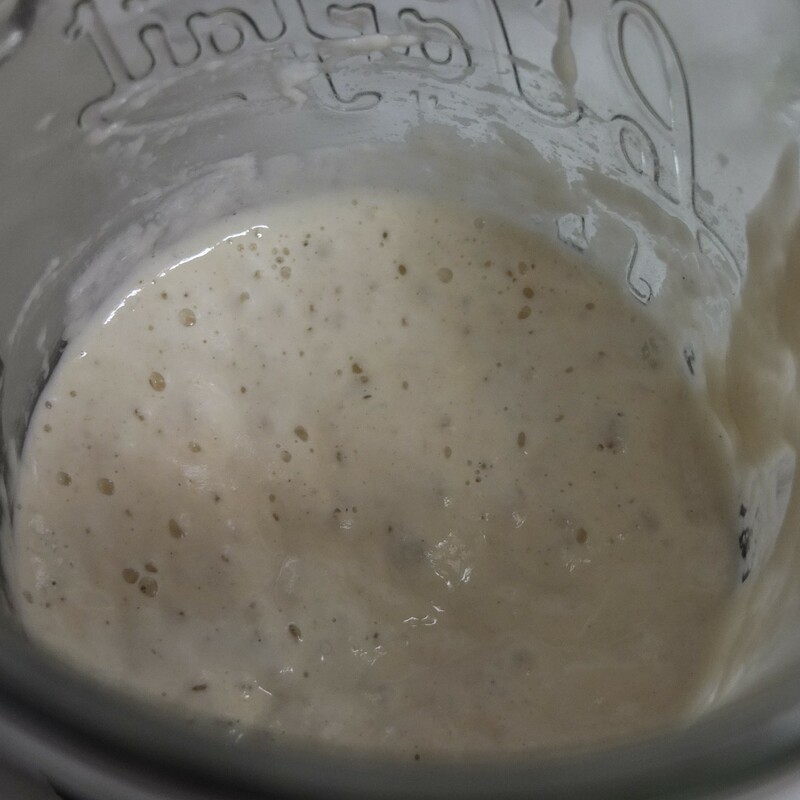 Vanessa Kimbell, the main tutor on our Sourdough School course explains how to make a starter here. Bakers use slightly different ways and measurements for making starters – make one then patiently await signs of activity (the bubbles). 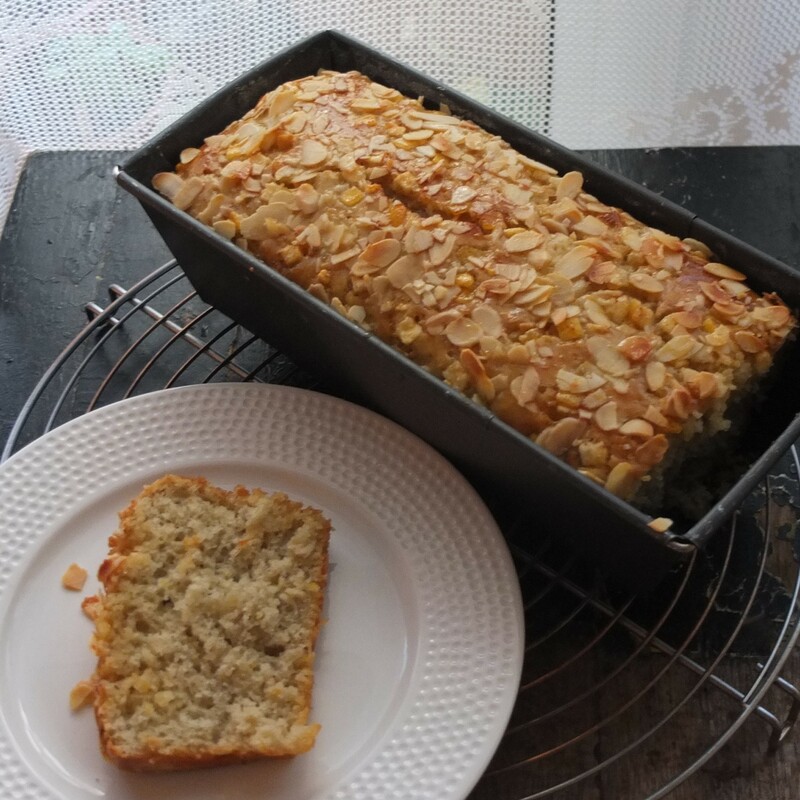 For this recipe you should refresh your starter (feed it once or twice) before making the cake, using a ratio of 25g starter diluted first with 100g/ml warm water (between 28°- 34°C) then mixed well with 100g strong, ’00’ or all-purpose white flour. This gives you a mild lactic starter nice for sweet cakes. Quantities for 1 loaf tin (about 25cm x 11.5cm/10in x 4.5in and 6.5cm/2.5in high) or two 16cm/6.3in diametre round cake tins (or a large round cake tin). Be flexible because timings depend on your room or fridge temperatures, starter and oven. My possible timings no. 1 are partially based on Barcelona summer temperatures of 28 – 31ºC with no air-conditioning. Yes oh dear. 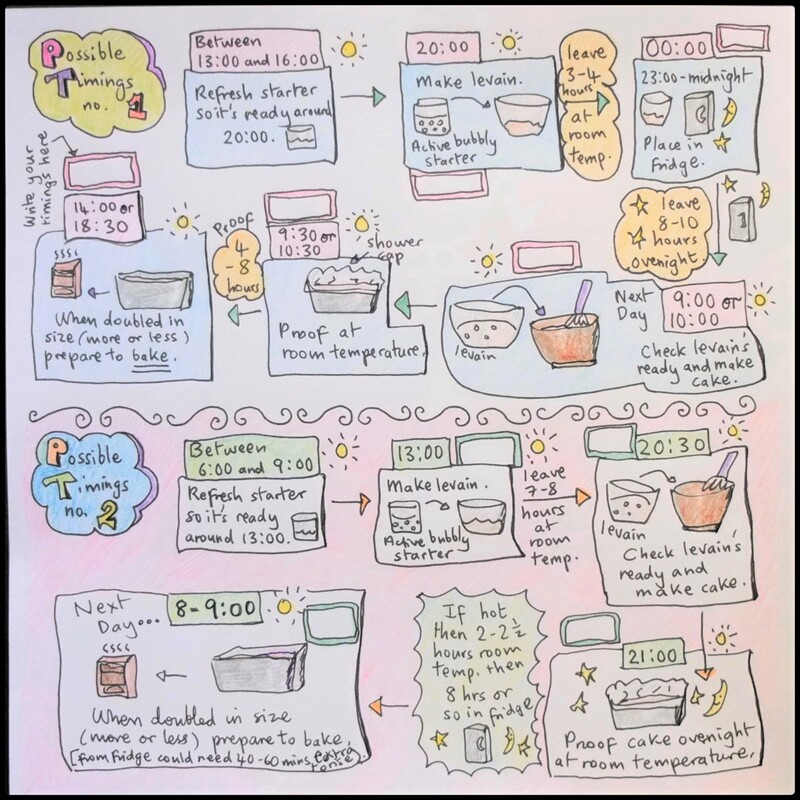 But there are de-humidifiers and if you look at the bright side there are great advantages to sweating toxins out, getting a nicer skin and becoming slightly fitter in a more satisfying way than I’ve experienced doing hot yoga. Lol (they don’t give you cake at yoga classes). 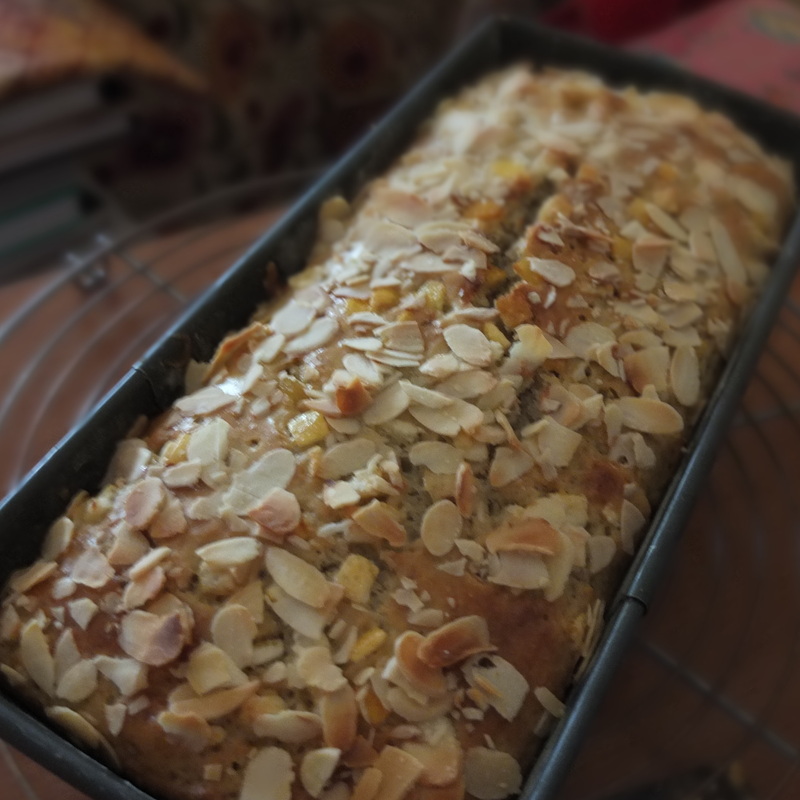 I prefer the no.1 timings because I can keep an eye on the cake as it rises (still haven’t got over the sourdough cake that overproofed crazily in the night – delicious though!). No. 2 timings are great if you live in a cooler climate. And there are spaces in the double boxes to record your own timings. Whisk active starter (left photo) and milk to combine till smooth then stir in the flour and sugar. 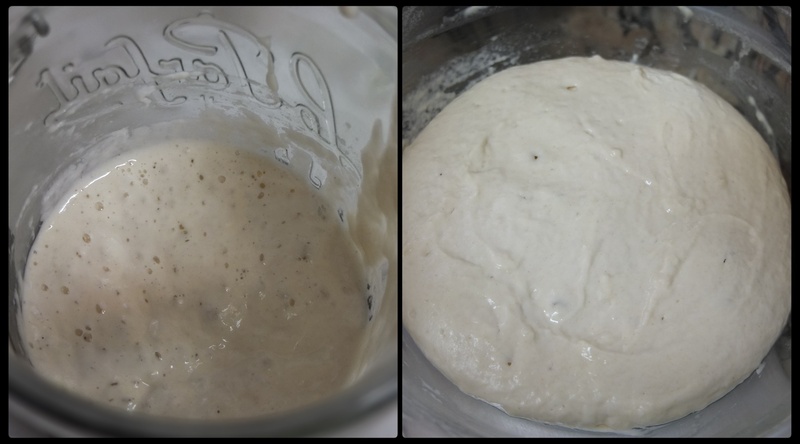 Let the levain develop until it is slightly domed with a few bubbles and mild slightly tangy aroma (right photo). It won’t look super active but will be fine and develop more in the cake itself. 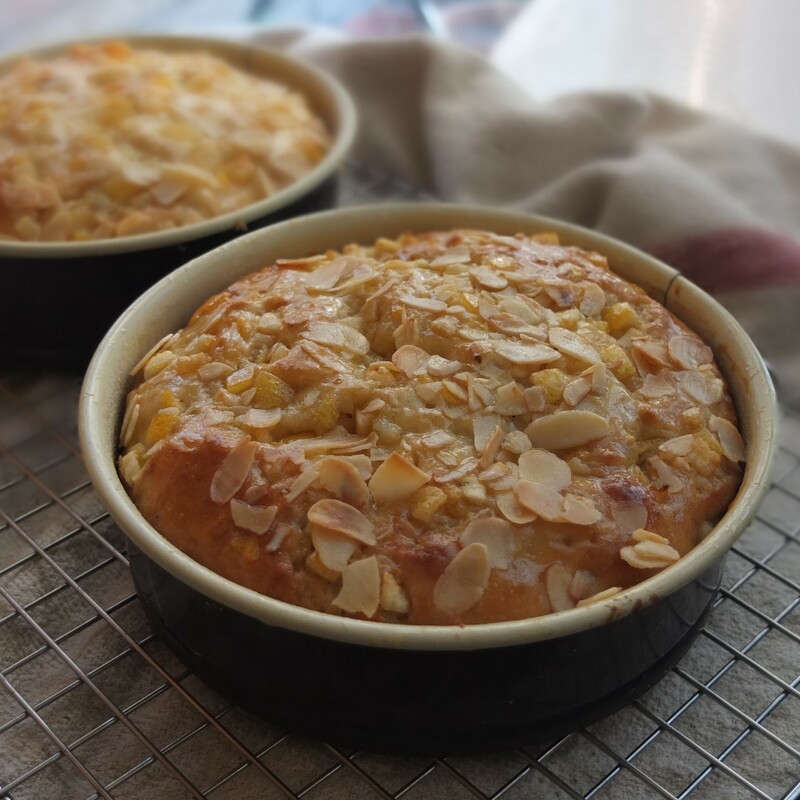 Preparation: butter and flour your cake tin(s) – you can sprinkle with a handful of flaked almonds after buttering and before flouring if you like – you might find almonds fall out so just throw back in at the bottom. Add the butter to the liquids in Step 3. It’s good if the tin is filled to about 1/3 (or under half) of the way up. Cover the tin with a plastic shower cap or damp tea towel to proof and almost double in size. When cake has almost doubled in size pre-heat oven to 175ºC/350ºF (fan/convection oven) or 195ºC/380ºF (static/non-convection oven). 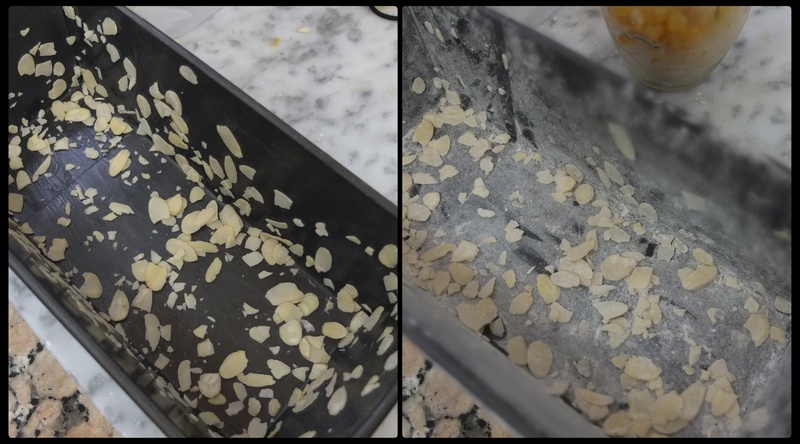 When doubled in size brush top lightly with beaten egg then sprinkle with flaked almonds and bake 5 minutes then lower temperature to 170ºC/340ºF (fan) or 190ºC/375ºF (static) and bake 15 more minutes. Then lower to 160ºC/320ºF (fan) or 180ºC/350ºF (static) and bake a final 2-7 minutes. The cake is ready when it’s light golden brown, a skewer inserted in the middle comes out clean and when you press the top with your finger it springs back a little. Take it out. While the cake is baking make the soaking syrup. Bring the maple syrup to the boil in a small heavy-based saucepan. Add the citrus juices and bring just to the boil again. Take off the heat and add the orange blossom water if using. Let the baked cake cool in the tin 10 minutes on a wire rack then make holes with the skewer and spoon some of the soaking syrup over the cake. Wait for it to be absorbed then spoon more over it again. Repeat until syrup is all used up. Cool in the tin 20 minutes then take out of the tin and cool completely on a wire rack. 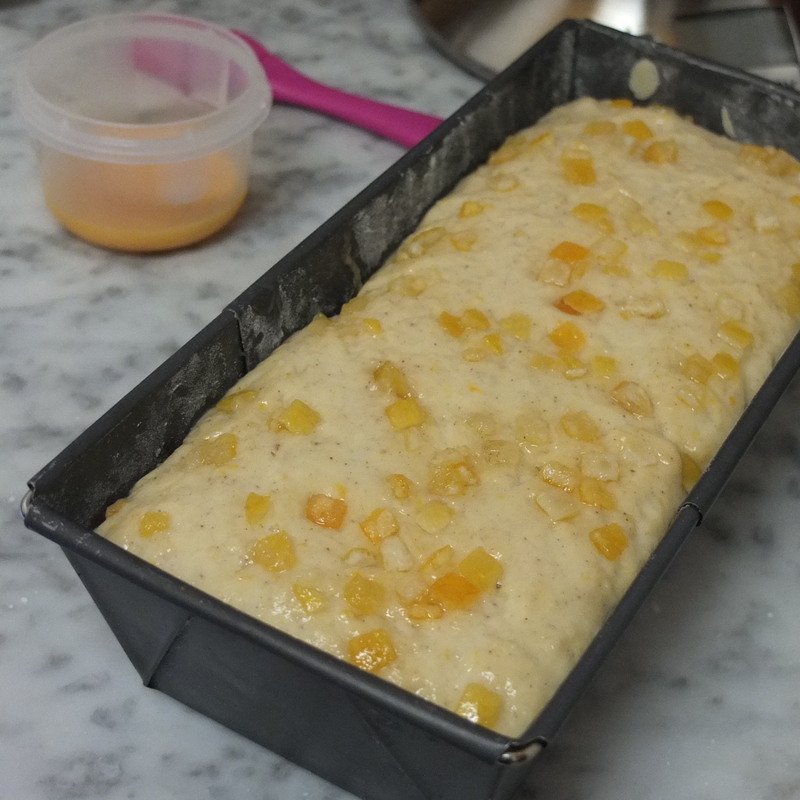 Couldn’t wait to try this cake… so cut a slice out of the tin as it cooled. Yum. Eat immediately or while warm the same day. Once cool wrap tightly in plastic film or a re-usable plastic bag and store at room temperature in airtight tupperware – keeps 3-4 days at least. You can also freeze slices wrapped in plastic film up to 1 – 2 months (defrost at room temperature a few hours or so). I suggest slicing with small sharp knife, which somehow cuts fluffier slices than a bread knife. 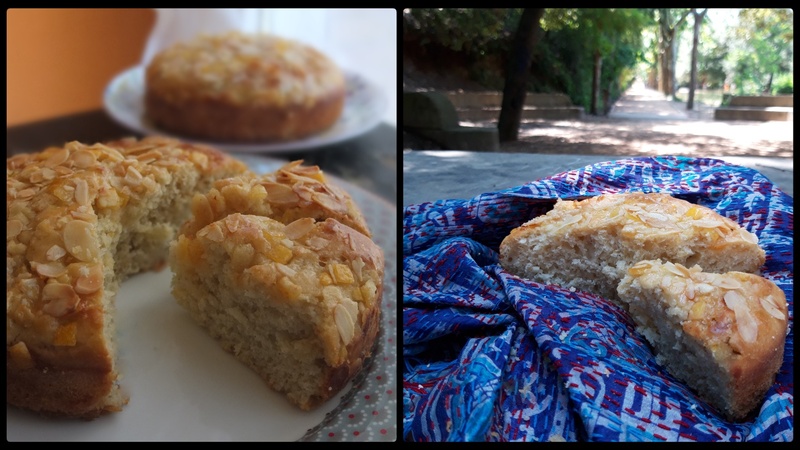 It’s a great tea time or picnic cake – my friend managed three slices ;). My mother introduced me to sourdough bread and gave me my first starter that I called Serafina. I wasn’t that keen on the bread at first then realised it doesn’t have to be sour! 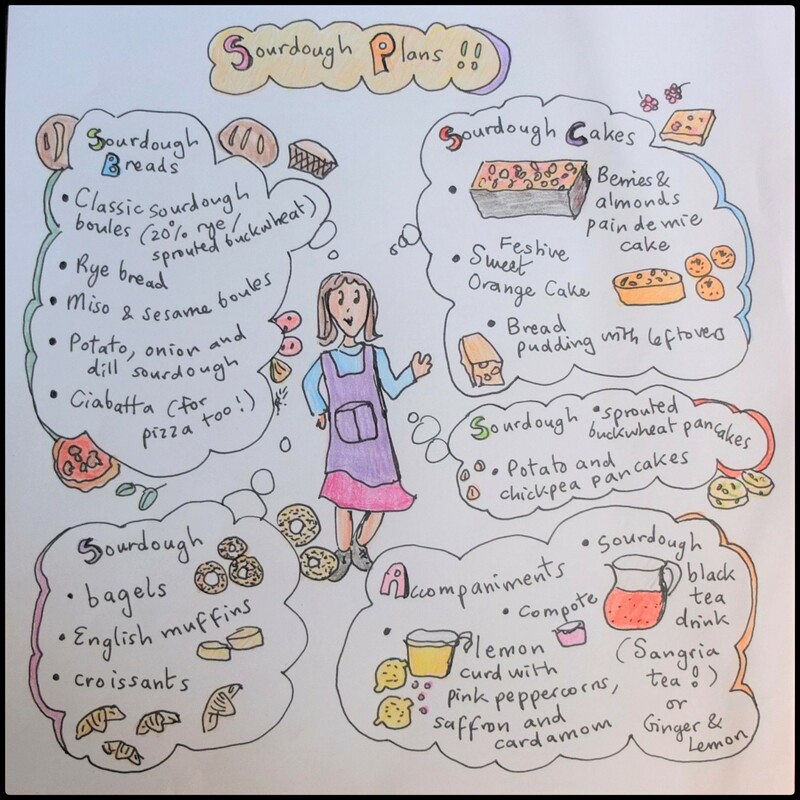 On the 6-day Sourdough diploma course I also learnt it’s possible to eat quite a lot of the bread without feeling bloated or tired and that sourdough can be used to make cakes and drinks! Hurray! Me and mum had a lovely time making bread and other sourdough stuff while getting to know fellow bakers on the course. It was great to be in the countryside too. 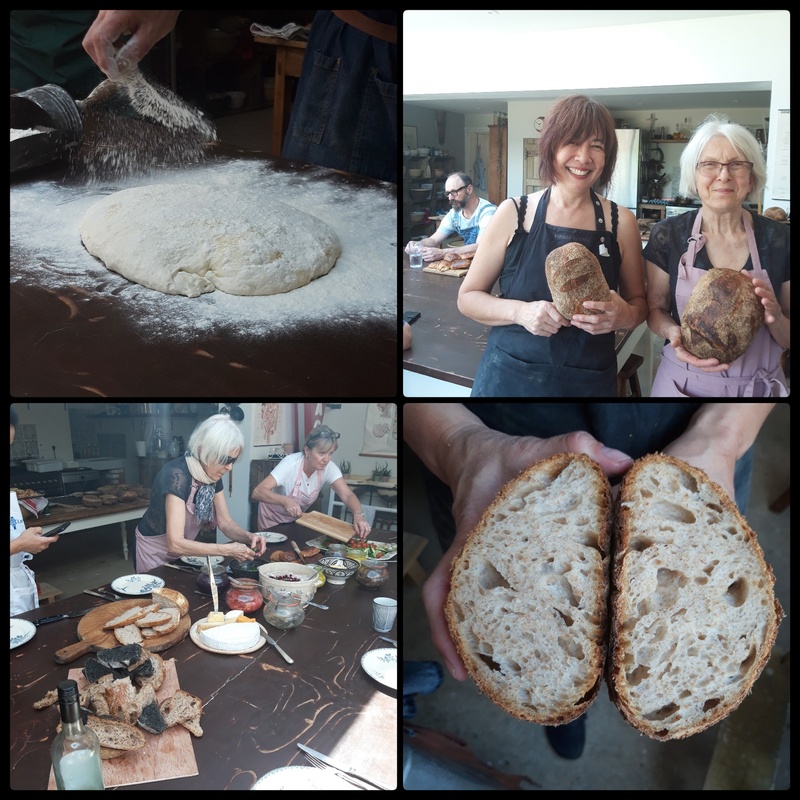 We’ve all been very inspired by our tutors Vanessa and Emmanuelle to go home and make lots of sourdough goodies. 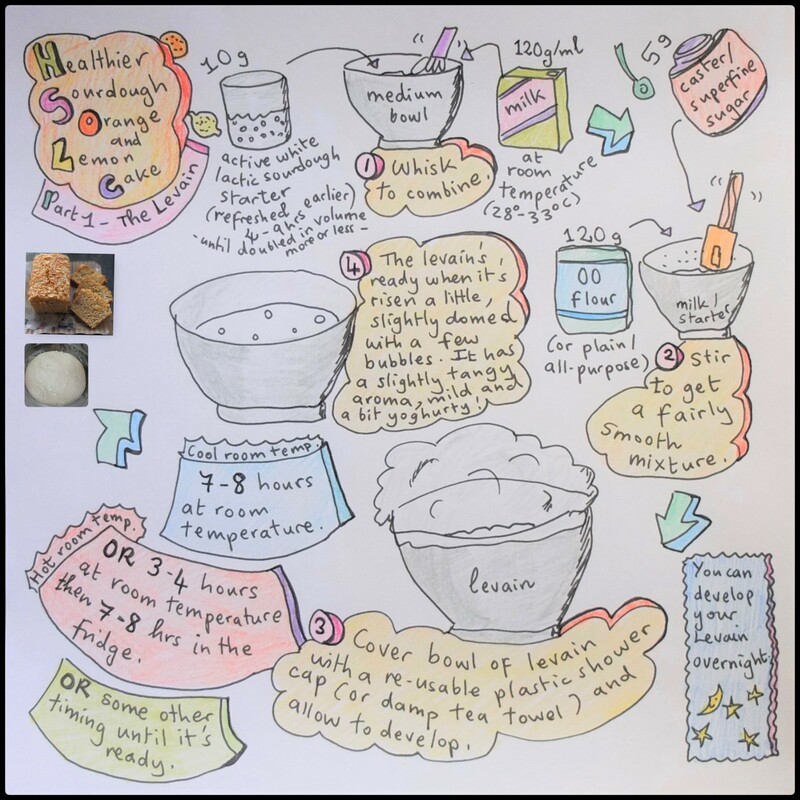 Some recipes are in their books: How to Make Sourdough by Emmanuelle and The Sourdough School by Vanessa. They look delicious! I’ve only made sourdough bread once before when a friend gave me some starter. I didn’t keep it up. Dear Lili, The image of your sour dough cake rising by your bedside will forever be burned into my memory. 🙂 What a delicious combination of ingredients. I’ve only thought of sourdough in relation to bread. This should be a revelation. Well done Lili. I went on Vanessa’s course about four years ago and I’ve baking sourdough bread ever since. 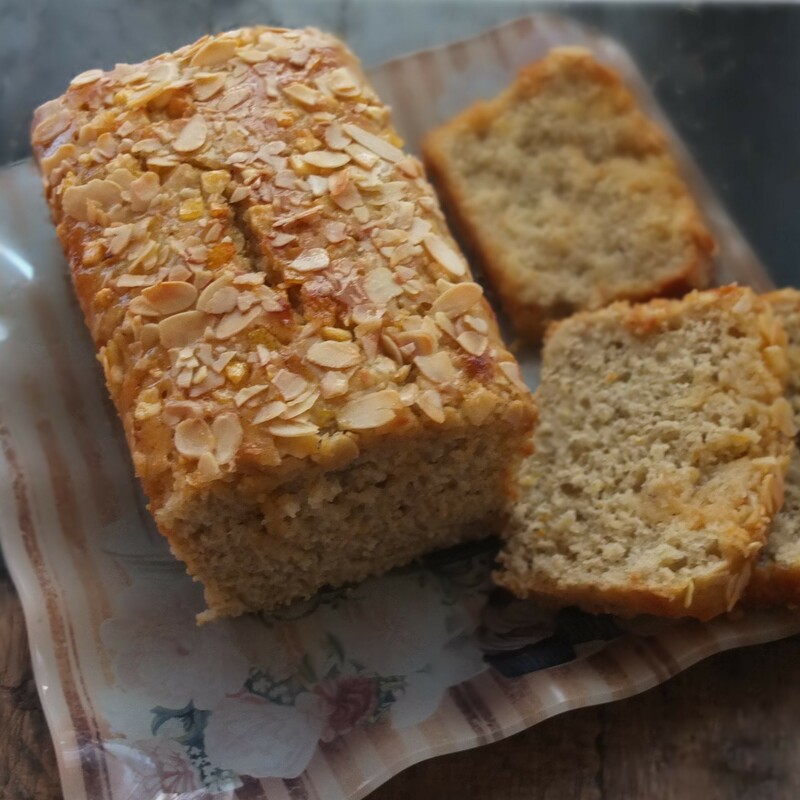 Cakes are more of a mystery so, as I’ve dietary problems, I’m going to mix your recipe with one I found a few years ago that uses up that sourdough discard. 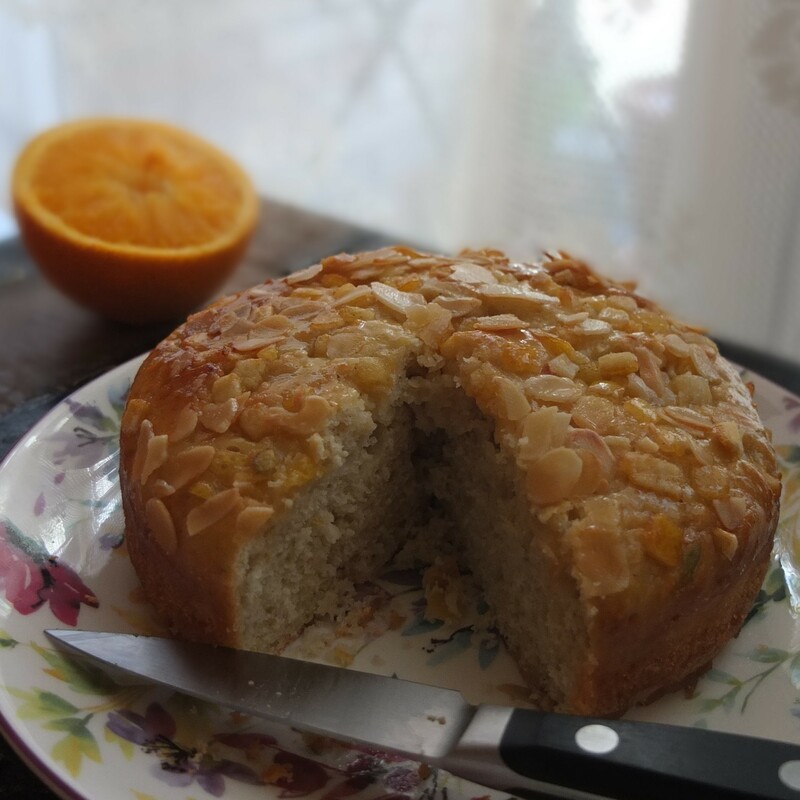 More sourdough cake recipes please!